Tell the city: Build the Basic Bike Network now! Safe bike lanes downtown are in jeopardy. 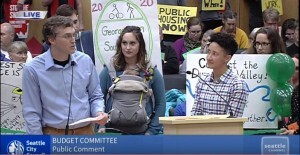 We need your help to demonstrate support for building the #BasicBikeNetwork now by showing up at the Seattle City Council Transportation Committee meeting this Tuesday! RSVP and learn more. What’s the Basic Bike Network? It’s a vision for a connected network of safe streets to bike on, not just disconnected pieces here and there. When the #BasicBikeNetwork is built, the city expects to more than double the number of people who bike downtown by 2023. And we also know that protected bike lanes make it safer to walk too by separating car turning and walking signal phases. But the basic bike network has already been delayed years because of politics, and we can’t wait any longer to make our city safer and more accessible. 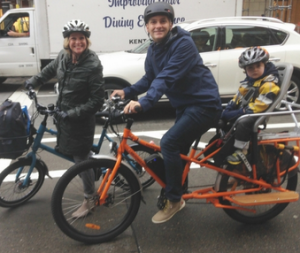 Join us as we tell the city: Build the Basic Bike Network now! How: By standing with us and holding signs of support (we will have some available) during the public comment period of the meeting. 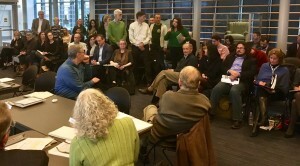 If you’re interested in speaking please contact clara@seattlegreenways.org. Kids and families very welcome! Can’t make it? Stay tuned for more opportunities. Thank you and we hope you can join us on Tuesday! I was surprised when SDOT told Beacon Hill Safe Streets they wanted to downgrade the planned Swift/Myrtle/Othello protected bike lanes that had been originally included in the 2018 repaving project, to just bike lanes. Including protected bike lane upgrades as part of repaving projects is significantly cheaper to implement than coming back later and doing the work as a bike only project, because the work crew is already there ripping up the road and is able to just repaint different lines and adds posts. So why the downgrade? It was probably because this route wasn’t considered a top priority. In previous conversations advocates had agreed that our efforts should be focused on North-South connections to rest of the city’s bike network and to downtown. But the significant cost savings meant it would be much harder to come back later after the higher priorities were completed. And while not the top priority, this route does connect to important locations: the Othello Light Rail Station, grocery stores, Van Asselt Playground, Van Asselt Community Center, John C Little Park, New Holly Childhood Center, and is close to Cleveland High School. It’s also one of the only East-West connections across south Seattle due to I-5 and other barriers. This route connects the Othello neighborhood to South Beacon Hill to Georgetown, and once the Georgetown-South Park Trail is completed, to South Park as well. 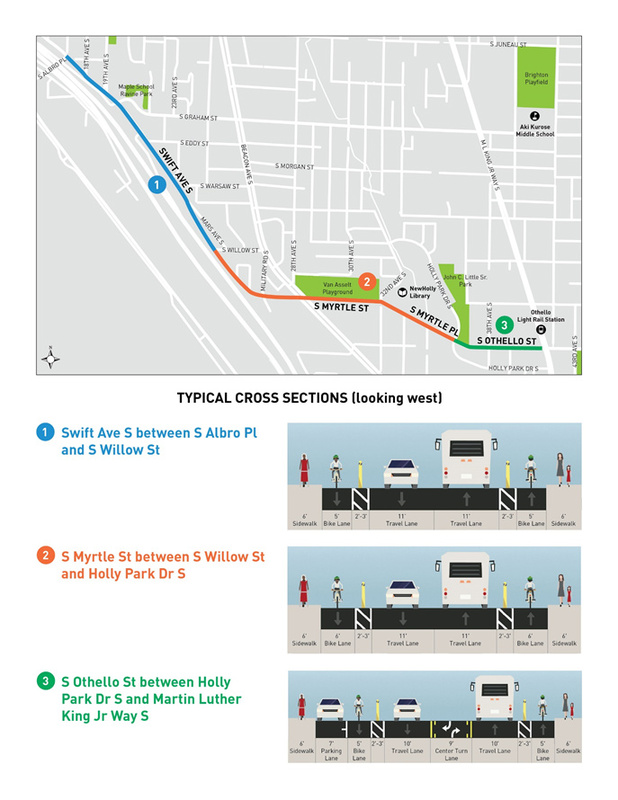 That’s why West Seattle Bike Connections, Duwamish Valley Safe Streets, Beacon Hill Safe Streets, Rainier Valley Greenways, and the Seattle Bicycle Advisory Board were all supportive of this route: they recognized the importance of linking south end communities. After our groups stood united and said no to the downgrade, we won back the posts and buffers for the bike lane. 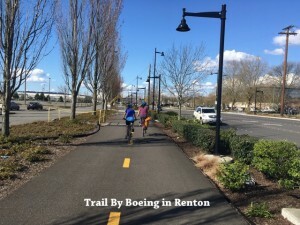 And while the design isn’t perfect, and we know that it won’t be an instant success because the rest of the bike network is still years away, we are incrementally building a path forward to a day where anyone in South Seattle can hop on a bike and use safe, connected, simple routes to get to the places they want to go. If you value our work, please donate to keep us going. Note from SNG Executive Director Gordon Padelford: People who live on Capitol Hill love to walk and they love to take transit. 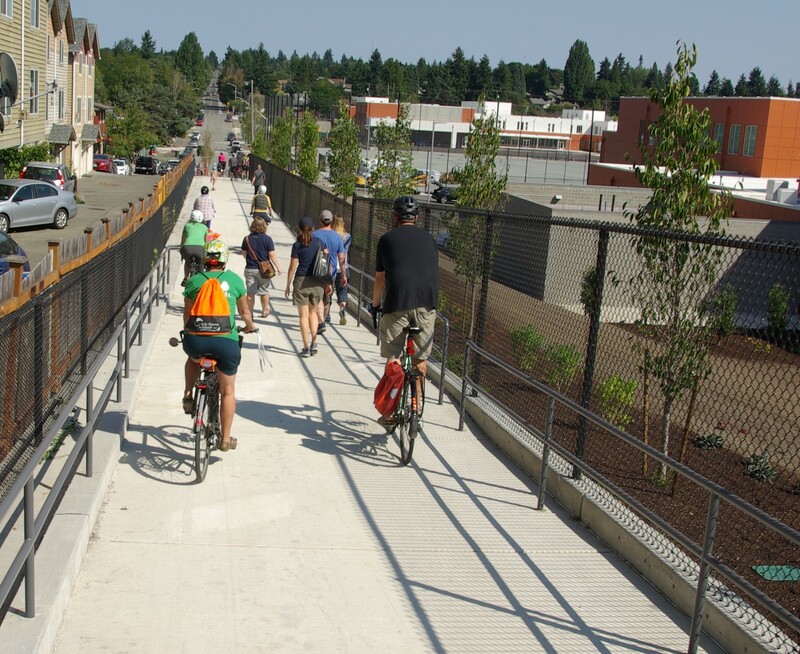 Thanks to the hard work of Central Seattle Greenways, it’s going to soon be easier to do both. Creating safe routes so that people can walk and bike to transit lines and hubs is a strategy that we’re working on with our local groups across the city. 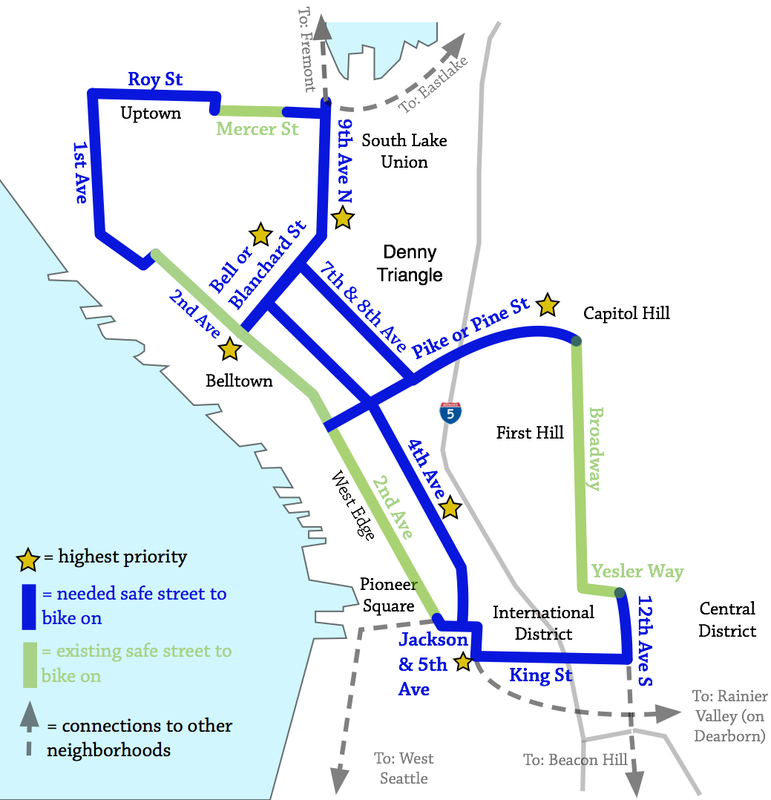 The East-West John/Thomas Street corridor across Capitol Hill is a key street for accessing transit, hosting Metro’s frequent routes 8 and 10, and providing a direct connection to Sound Transit’s Capitol Hill Station. Unfortunately, today the corridor is difficult and dangerous for people on foot to cross at the many intersections lacking traffic lights. Along the corridor parked cars near intersections make visibility poor so many people driving fail to yield to people walking across the unmarked crosswalks. John and Thomas are wide streets, leading to high vehicle speeds and long crossing distances. This makes it hard to access bus stops along the corridor and to travel north-south across the corridor to the many parks, businesses, and homes on Capitol Hill. In 2016, we proposed installing curb bulbs at the unsignalized intersections along the corridor in order to reduce crossing distances, improve visibility for people attempting to cross, and lower vehicle speeds. 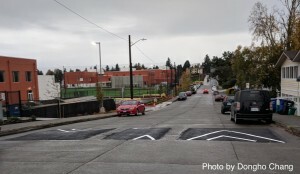 We won funding for these improvements when the Levy to Move Seattle Oversight Committee selected this project through SDOT’s Neighborhood Street Fund (NSF) program, noting that the corridor had the highest collision rate of all the projects being considered. The NSF program operates on a three year cycle. Projects were selected in 2016, continue through the design process in 2017, and will be constructed in 2018. Working collaboratively with SDOT, we arrived at a design that fit within the $1 million scope of NSF project while still providing safety improvements at every unsignalized intersection along the one mile corridor from Broadway to 23rd Ave E. In general, the design provides concrete curb bulbs at all four corners of every intersection that includes a bus stop, while using less expensive flex-posts and paint to create curb bulbs at the other intersections. 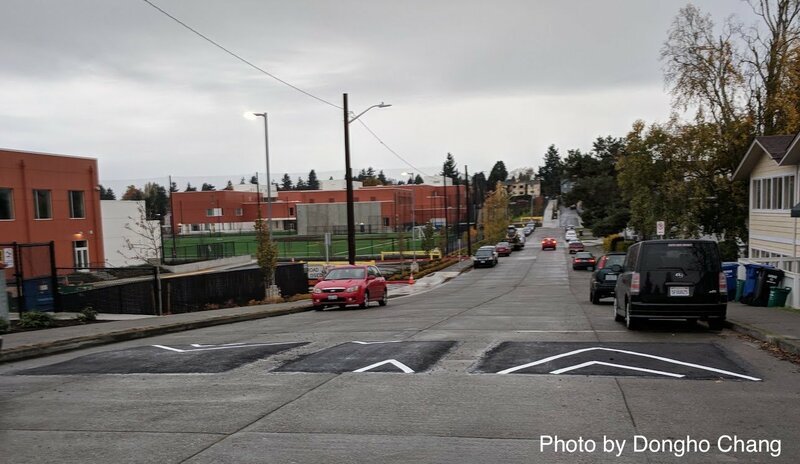 Early in the process, a separate Neighborhood Park & Street Fund project was folded into the design to include a flashing crosswalk beacon at E John St & 10th Ave E.
SDOT also coordinated with King County Metro, which was planning improvements in the corridor for route 8. Metro joined the project as a funding partner, increasing the scope of the project to relocate the westbound bus stop at Broadway to be nearer the light rail station entrance and adding large bus bulbs at E Olive Way & Summit Ave E, E John St & 10th Ave E, and E Thomas St at 16th Ave E and 19th Ave E. As the design process continues, the team is hopeful that there will be sufficient funding to include concrete curb bulbs at E Thomas St & 18th Ave E, proposed as a crossing for the future Central Ridge Neighborhood Greenway. Most recently, SDOT announced that they’ll be installing a left-turn signal at the busy intersections of E Olive Way / E John St & Broadway E. This is a fantastic development that will help make this dangerous and confusing intersection a safer place for people walking, biking, taking transit, or driving, and supports the 2017 SNG priority for District 3, addressing some of the difficulties that Central Seattle Greenways identified in our 2016 audit of the station area. We look forward to continuing to work with SDOT as the design for this corridor is finalized and construction begins next year. Safe streets advocacy can be a long, arduous haul. But sometimes we just get to throw our hands up in the air and shout “YES!! We did this! 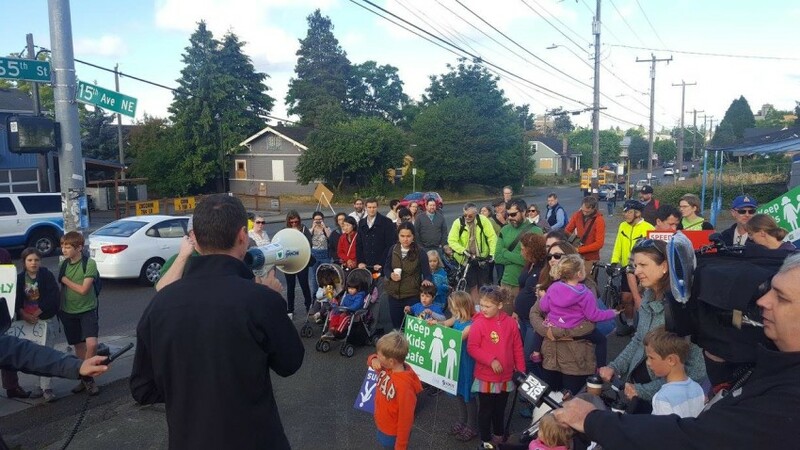 !” On August 27 we celebrated a key step in knitting North Seattle neighborhoods together, easing walking and biking between east and west, and bringing critical safety improvements to the routes to and from three newly-opened schools. Our ribbon-cutting gathering of 100+ neighbors took a moment on a sunny afternoon to cheer, in all: a protected bike lane on North 92nd Street; a new mixed-use trail running along the multi-school complex and connecting two parts of 92nd; and a new bike and pedestrian signal on 92nd at Aurora Ave North. 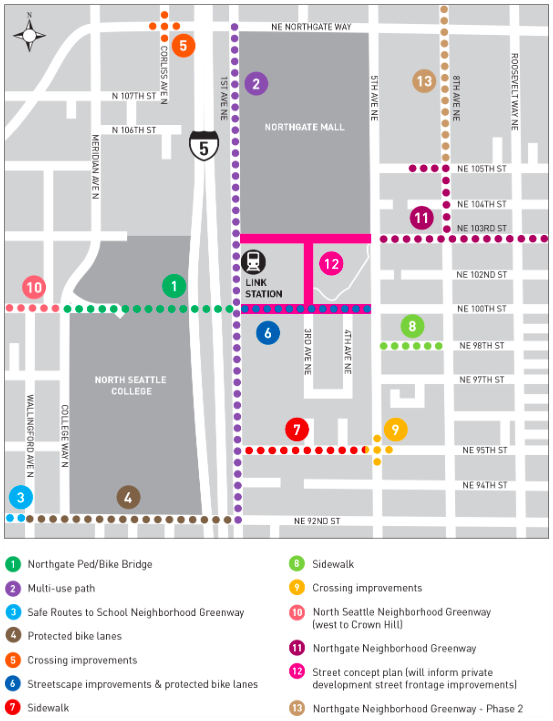 For seven blocks between North 90th Street and North 97th Street there had been no east-west through-route connecting Aurora with Wallingford, College Way, and North Seattle College. A traveler on foot or bike had to wind one’s way on several discontinuous streets. In the 30 blocks between North 80th Street and Northgate Way, the only option for crossing I-5 by bike or foot was at the North 92nd Street overpass. And efforts to go west from there had been frustrating — 92nd Street was discontinuous between Ashworth Ave North and Stone Way North. To continue to the west one had to jog to North 90th Street or North 85th Street. Due to heavy traffic, those east-west streets weren’t conducive to biking or walking and the intersections of those streets at Aurora were two of the most dangerous intersections on the state highway. Aurora Avenue (SR 99) is a traffic moat that splits several northern neighborhoods. With few signalized crossings, major traffic activity, and frequent injury collisions — it’s simply unsafe for biking and walking. 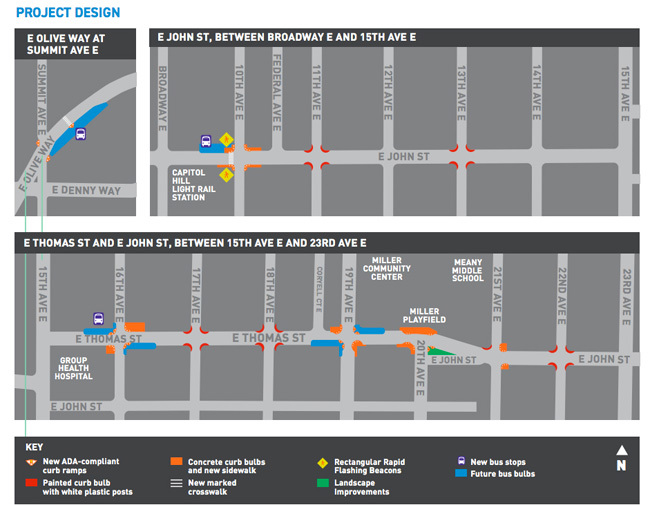 The safety challenges surrounding North 92nd Street and Aurora Ave were about to get worse. 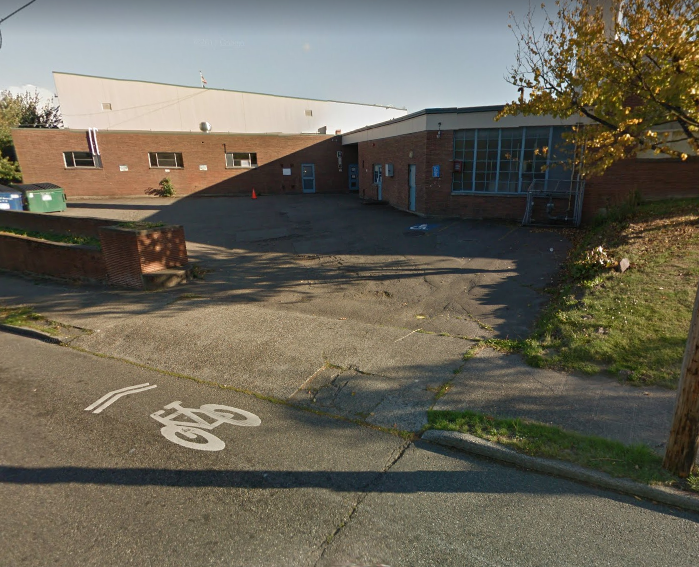 In 2013, Seattle Public Schools applied for permits to build three schools for 1,660 K-8 students on one multi-block campus — located on North 90th Street between Stone Way North and Wallingford Avenue North, a block east of Aurora. The safety issues were plain to see: many of the students in the schools’ catchment area would have to cross Aurora and I-5; and neighborhood-street traffic would increase considerably on 92nd Street east of the schools, and on 90th Street, in front of the schools. 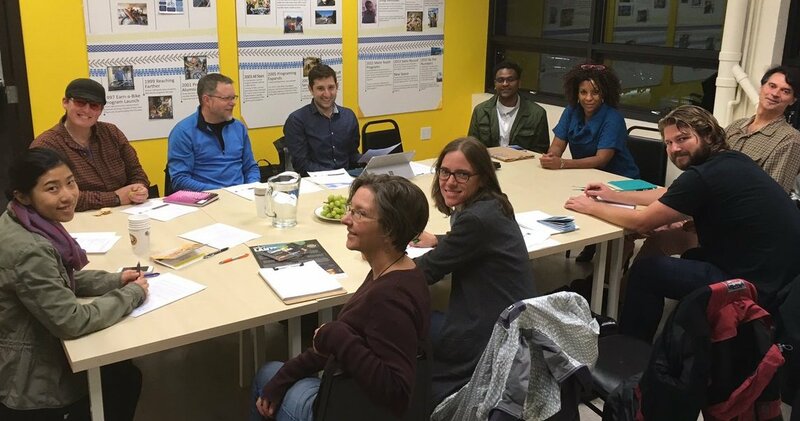 Licton-Haller Greenways and Greenwood-Phinney Greenways took the initiative and led community groups, including Licton Springs Community Council, Aurora Licton Urban Village alliance on a multi-prong approach. Make North 92nd Street a safer and continuous east-west link from the Maple Leaf/ Northgate neighborhoods on the east of I-5 through to Greenwood and Crown Hill to the west. Solution: Make 92nd a traffic-calmed greenway where possible; and where it’s a main arterial across I-5, create protected bike lanes. 92nd was discontinuous behind the schools; the school site extended across what normally would have been the 92nd Street right-of-way. 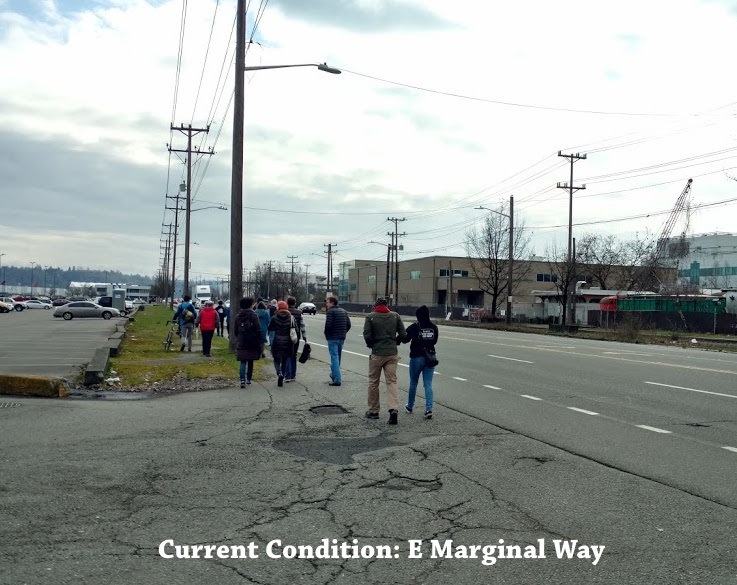 Solution: Convince the schools, the city’s development permit reviewers, and SDOT to establish a multi-use trail across school property to link both portions of 92nd. Create a pedestrian signal at 92nd and Aurora, complete with right-in right-out diverters. Solution: obtain funding and convince WSDOT and SDOT to implement it. Improve safety on North 90th Street in front of the schools, including providing new marked crosswalks and RRFB’s (rectangular rapid flashing beacons). Solution: obtain funding and convince SDOT to implement it. Create traffic calming on streets surrounding the schools. Solution: obtain funding and convince SDOT to implement it. The SNG neighborhood groups began a concerted effort in late 2014 that is still ongoing — creating concern and interest amongst the neighborhood, community groups, decision makers, funding sources, and technical personnel. 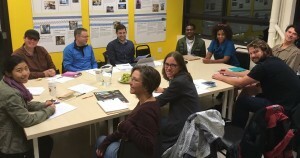 Licton-Haller Greenways and Greenwood-Phinney Greenways volunteers began making presentations to the city’s development permit reviewers to affect terms of the permit. 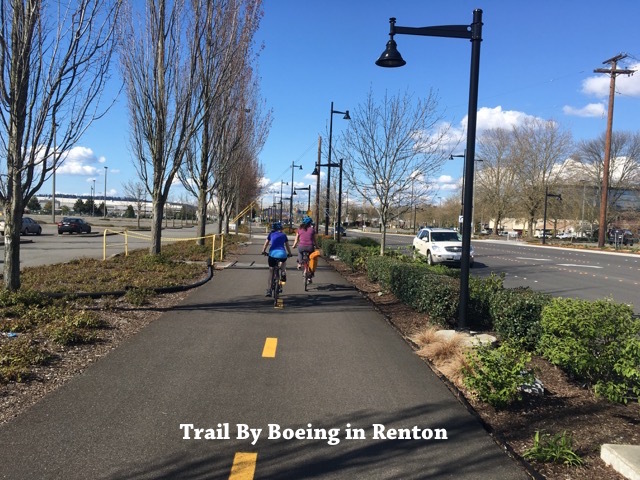 They approached the School Traffic Safety Committee for their support in convincing the school district and SDOT to create the missing link trail behind the schools. 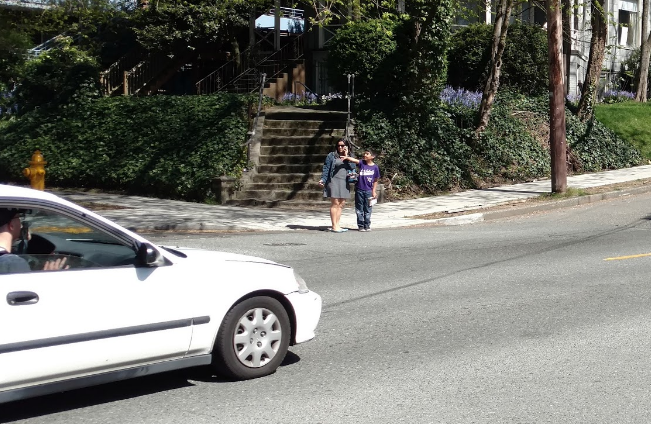 They held a series of on-site Safe Routes to School audits by Greenways members, parents, and members of SDOT and the School Traffic Safety Committee and produced a substantial study documenting their findings. They held separate personalized walks for three councilmembers and continually lobbied them and their staffs. They participated in a Find It Fix It walk with the mayor and city department heads and lobbied them. 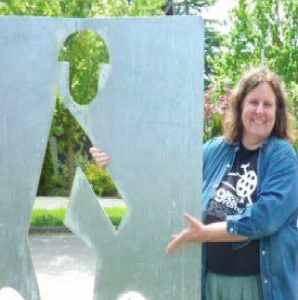 They leveraged their working relationship with the staff in SDOT’s Safe Routes to Schools and greenways groups. Building Community Will … and Locating the Funding Too! 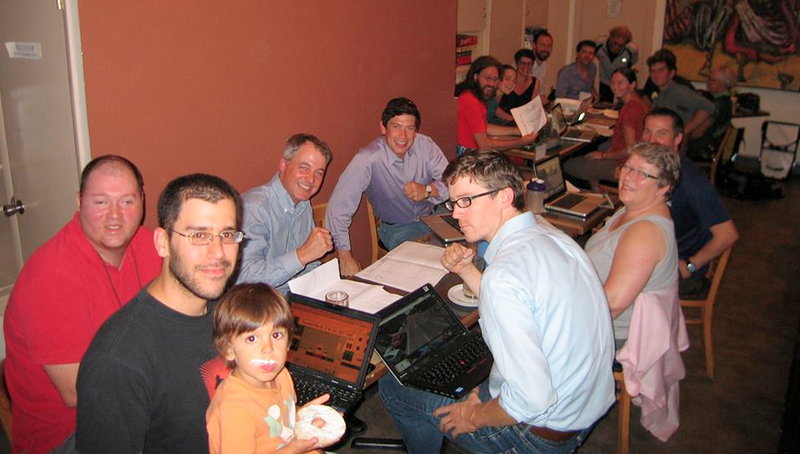 In 2015, the SNG groups applied for Neighborhood Park and Street Fund and Neighborhood Street Fund grants. They weren’t successful. They redoubled their efforts, adjusting as needed, and in 2016 applied again — this time winning part of the funding. Critically, their timing coincided with the citywide Move Seattle funding victory and with SDOT’s own greenways team getting ready to build out part of a network in north Seattle. 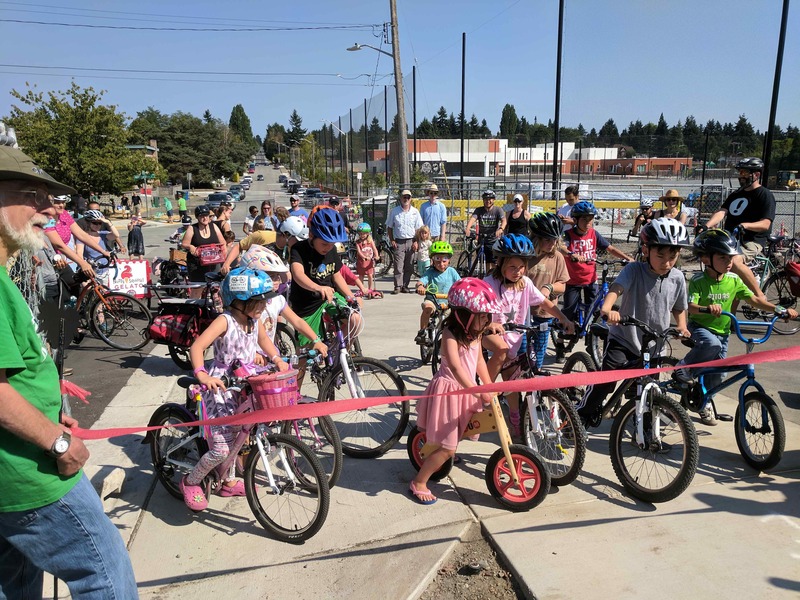 On August 27 this year, the SNG groups hosted dozens of kids and supporters celebrating the completion of the multi-use trail behind the schools, the completion of the protected bike lane on 92nd from Wallingford across I-5 to 1st Avenue NE, and the completion of the pedestrian signal at Aurora and 92nd. Safety provisions on North 90th Street and on Stone Way North adjacent to the schools have been planned, but are still not implemented – kids still must dart across the street to and from their school, without crosswalk markings and without the promised RRFB’s. 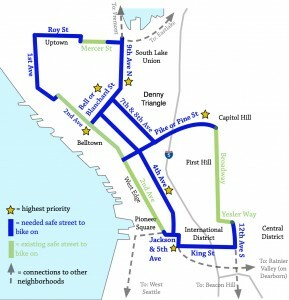 And the North Seattle greenways network is not yet totally planned. Hope are they’ll be implemented in 2018. The idea is simple enough: connect “main street” of Georgetown to “main street” of South Park with a walking and biking path. But, for nearly 20 years residents of South Park and Georgetown neighborhoods have been unable to get traction on their vision — until now. Tired of waiting any longer to connect their two neighborhoods, residents formed Duwamish Valley Safe Streets (DVSS) in 2016 and became part of the Seattle Neighborhood Greenways coalition. Drawing on the history of neighborhood planning and community wisdom, DVSS quickly began championing the idea of the Georgetown to South Park Trail (GTSP Trail). Safety: protected pedestrian infrastructure on the E Marginal Way corridor. Momentum builds, City takes an interest … and ultimately, Victory!! The GTSP Trail has gained tremendous momentum over the past year. 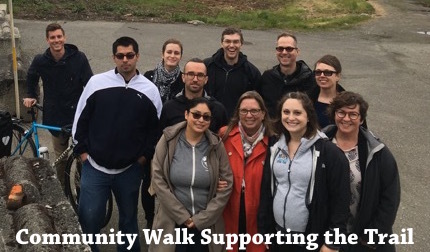 DVSS has coordinated and hosted walks with City Council members, SDOT, and local organizations to highlight the possibilities of the GTSP trail. Landscape Architecture students from the University of Washington have provided input, inspiration, and conceptual ideas of what the GTSP trail could be for the community. Perhaps most importantly, DVSS and SNG members have identified community outreach and design as the next critical steps in the process. Members advocated for the GTSP in meetings with City Council members and testified at two budget hearings to advocate for funding in the 2018 budget. All this hard work paid off when the Seattle City Council included $600,000 in the City’s Budget for community engagement, planning, and design of the trail! Outreach and design will likely take two years and one year to construct, so we hope to be walking and biking on the trail in 2020! If you value this project, please donate to keep the momentum going. What do walking and biking connections, affordable housing, and parks have in common? They are foundational to our quality of life in Seattle. And while our focus is on walking and biking, sometimes we can achieve more by working in broad coalitions. 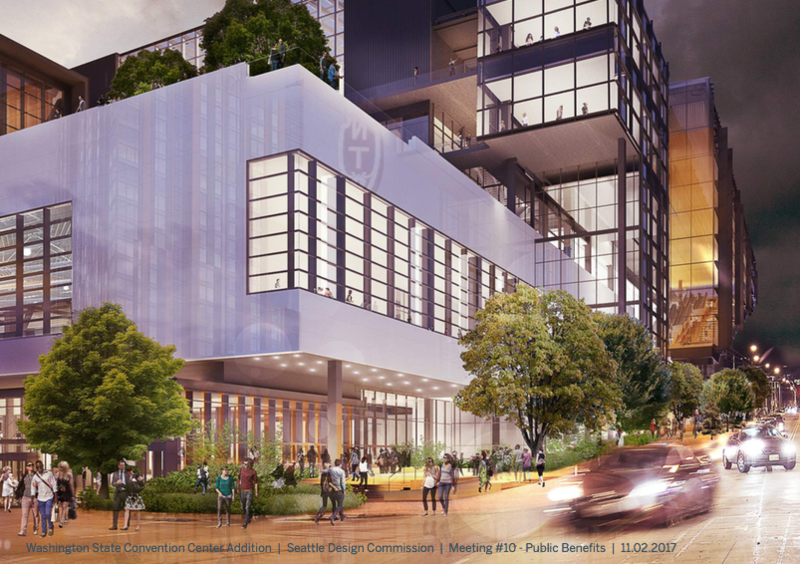 In the fall of 2016 the Washington State Convention Center sought feedback about what the surrounding neighborhoods wanted in exchange for building a massive expansion of its facility on publicly owned land. It asked the public: do you want investments in affordable housing, parks, or walking and biking projects? Pitting these basic community necessities against each other didn’t seem fair, because this was the largest real estate project in Seattle history, and similarly sized development projects had offered much more. 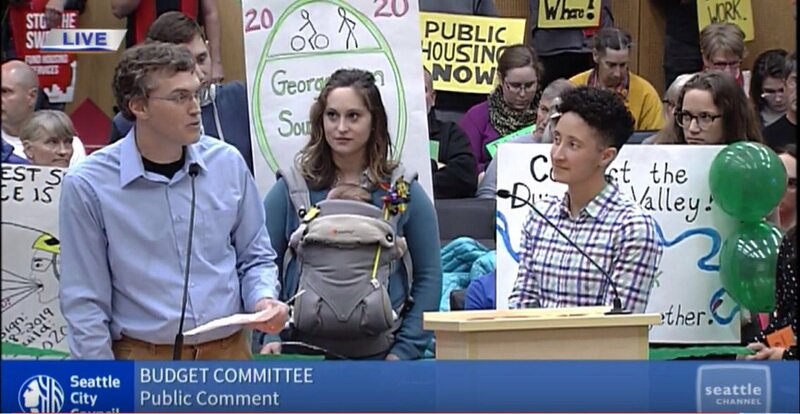 So Seattle Neighborhood Greenways convened a coalition of transportation, parks, and affordable housing organizations to fight for a fair deal. The Community Package Coalition, as we call ourselves, is made up of our neighborhood groups Central Seattle Greenways and the First Hill Improvement Association as well as Capitol Hill Housing, Cascade Bicycle Club, the Freeway Park Association, the Housing Development Consortium, Lid I-5 and of course Seattle Neighborhood Greenways. Over the past year the coalition successfully made the case for a fair package of investments, and struck a deal with the convention center for $82 million in investments for walking and biking connections, affordable housing, and parks. Pike-Pine protected bike lanes connecting the 2nd Ave protected bike lane in downtown to the Broadway protected bike lane on Capitol Hill. This corridor has huge potential as it already sees 20% of people traveling by bike despite the unsafe and uncomfortable current conditions. 8th Ave protected bike lanes from Pike St in downtown and Bell St in Belltown. Olive Way Walking Improvements that will make it safer to walk across the I-5 interchange for the thousands of people who walk between South Lake Union and Capitol Hill. Pike-Pine pedestrian improvements as part of the “Pike Pine Renaissance” improving the walking experience from downtown to Capitol Hill on Pike and Pine streets. Affordable housing funding to build 300 affordable homes for people making minimum wage. I-5 Lid Feasibility Study to study lidding parts of I-5 in the center city to create parks, affordable housing, new streets, and other civic uses. Freeway Park improvements that will make Freeway Park more safe, accessible, and enjoyable. 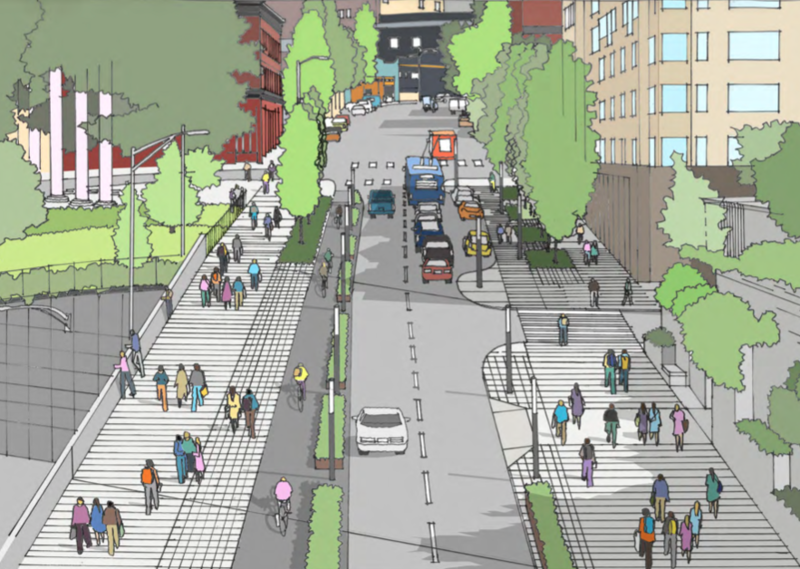 A Terry Avenue Promenade that will build a park like street on First Hill. 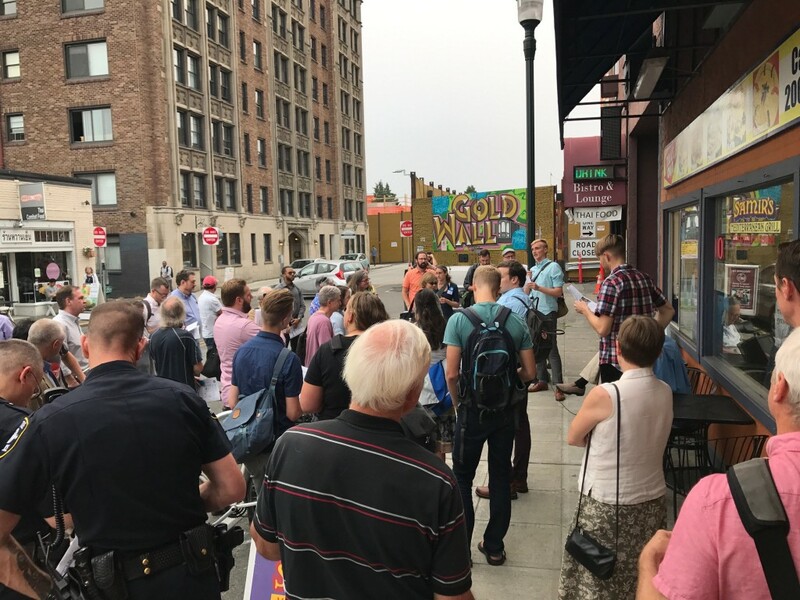 The funding we won is critical, and we’re going to keep working hard until these projects are built and we can all enjoy safe and comfortably walking and biking between these dense neighborhoods.